LONDON - while stupid Noel Gallagher (the media darling blah blah blah) quoted the Philippines when repeating "no Oasis reunion" for the 10000th time, "not even for starving children", etc. 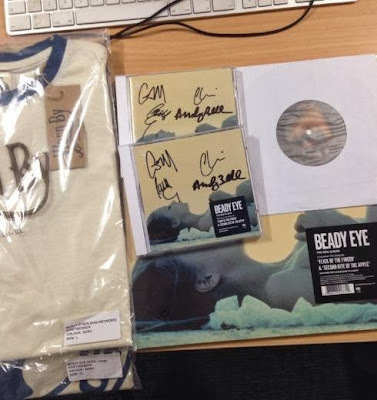 (see some posts ago), and he also didn't do anything for Japan, a host of bands including Beady Eye, Muse and Foals have donated special items to the Help 13 auction to raise money to help the survivors of the typhoon in the Philippines. Among the list of items up for sale over the coming weeks include signed items by Suede and Pulled Apart By Horses as well as an exclusive collection of original artwork, collectible prints, signed singles and merchandise. The first auction begins today (November 29) and all money raised will go to the Oxfam Philippines Appeal. Help Auction 13 was set up by Rebecca Vincent, a tattoo artist, who originally wanted to collect pieces from fellow artists and auction them off. Her husband, Pulled Apart By Horses drummer Lee Vincent suggested asking friends in bands to help too, which is when she enlisted the help of film-maker Charlotte Knight, who has worked with numerous bands. "After the horrific effects of the recent typhoon in the Philippines, we called on friends and colleagues in the world of art and music to donate items and the response has been astounding," Rebecca Vincent said. "More people are getting in touch every day and the list of donations is growing and growing." Pulled Apart By Horses' singer James Brown said: "Help Auction are helping people in this world that need help fast and now. So, to support something like this is beyond important to us and should also be for you."